A scientist from West Africa moved into the United States after living in Liberia and Sierra Leone. He was admitted to a medical facility, complaining of shortness of breath and suspected of pulmonary tuberculosis. An x-ray was ordered, an acid-fast bacillus (AFB) smear was made, and blood was collected to determine platelet counts and hemoglobin levels. 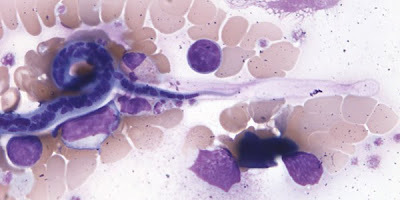 A Wright-Giemsa stained blood smear was made and reviewed; the objects seen on the thin smear were approximately 250 µm (based on the relative size of the white blood cells). Treating the patient with Azidothymine drug to reduce the infection load. Wuchereria bancrofti, larva of a filarial worm on blood smear - causes lymphatic filariases.